More than just home, Lift is a guide to elevated mountain living. Lift is a portal to adventure and renewal. Just a 35-minute drive from the Salt Lake City International Airport delivers you to the revitalized Canyons Village and the door to your Lift residence. Relaxation is easy knowing everything you need is just steps away, like lively cafés, chic watering holes, and curated shops. Outdoor adventure is equally close by: 7,300 acres of skiable terrain accessed by a planned high-speed chairlift to whisk up to the mountain, mountain bike trails that stretch for miles, and stunning alpine vistas. The Lift Residences are thoughtful, warm spaces to inspire lasting memories. Lift’s selections of 61 mountain residences range from one to five bedrooms, all fully furnished with a blend of modern architecture and warm, natural materials. Open the door, drop your bags, and exhale. An expanded Canyons Village features a careful blend of shopping, dining, and gathering spaces. Storefronts are designed to match the mountain environment, and generous patios invite people to linger and animate courtyards and pedestrian pathways. In a true village sense, people gather for outdoor skating, concerts, festivals, and traditions such as tree lighting, and they feel welcome and at home. 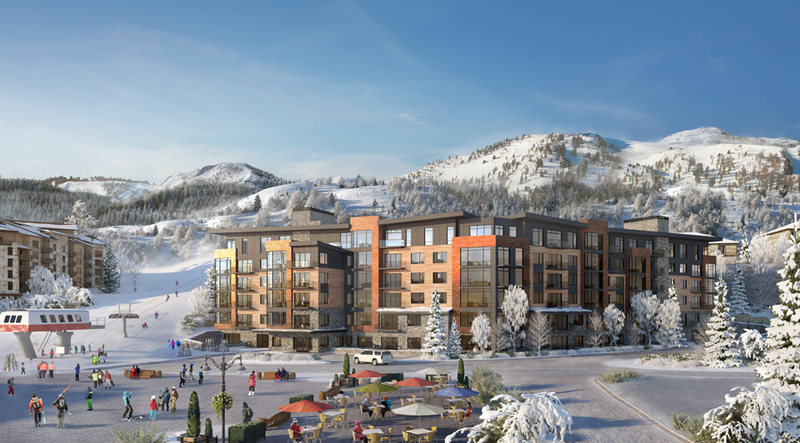 The nearby sun-soaked planned skier plaza will become a natural social hub and gathering spot and a place for Lift owners and guests to grab coffee, upload for first tracks, or to shop and dine after a day on the hill skiing or biking. And, it is the center for outdoor events and festivals. A revitalized master plan expands Canyons Village and connects it to the ski area, while eliminating conflicts between vehicles and pedestrians. Clear, generous streetscapes encourage people to wander and explore. 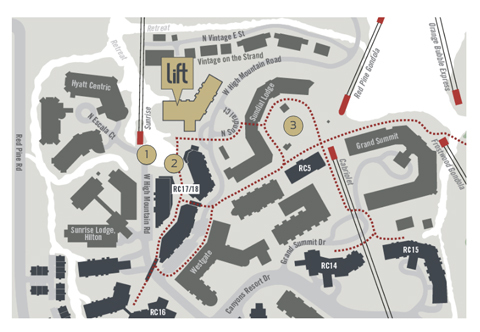 Lift features 61 mountain residences, ranging from one to five bedrooms, all fully furnished with a blend of modern architecture and warm, natural materials. 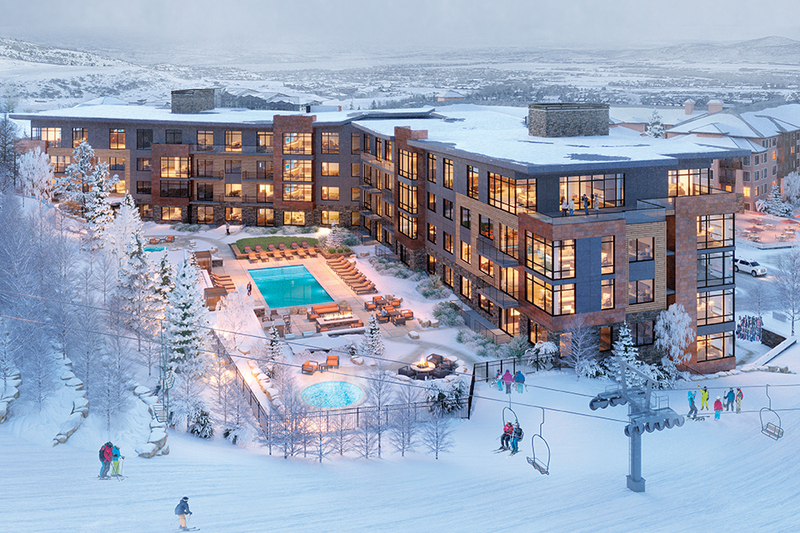 Even though the restaurants of Canyons Village are conveniently close by, Lift’s kitchens invite you to après at home. The kitchen is front and center in the open plan. Designed for cooking and entertaining, the seamless quartz countertops, hidden hardware, and Bosch appliances fit the contemporary aesthetic while standing up to daily use. At Lift, the generous highly social, multi-purpose kitchen island anchors the linear layout, so that whether you’re dicing vegetables, working on a laptop, or enjoying a glass of wine before dinner, you always remain visually and spatially connected to the views and main living space. Common spaces at Lift are thoughtfully designed for families to gather and make new connections. When it comes to vacation amenities, kids often draw the short straw with cramped spaces that feel like afterthoughts. Mark Rodeheaver, Broker Associate at Berkshire Hathaway, notes, “Lift floor plans are spacious and the building is perfectly intimate with planned spaces for kids.” In some of the Lift residences, kids get an airy bunkroom that doubles as a hangout space. The custom bunk beds are kitted out with camp lights and curtains, and a daybed doubles as a climbing space or a cozy crash pad for teens. On the pool deck, kids can happily play in the water and warm up by the fire pits. From a post-skiing soak to summer afternoons with the whole family, this outdoor living space is always the sunniest spot at Lift. Mark Rodeheaver goes on to say, “Lift is the ultimate outdoor launch pad for the under 18 crowd.” The downstairs Kids’ Zone is a space that tells a story of dreaming underneath the trees at base camp. Reading perches and LED lights hung with colorful ropes mimic the forest canopy. Teens also have a zone of their own, with multi-level lounge seating inspired by ski moguls and recessed, flat screens with built-in storage slots for gaming equipment. The second-floor Club Room encourages families to gather and get to know their neighbors while watching the big games on the five-screen video wall. This warm, generous space was designed to feel open, while encouraging one-on-one conversations. The Club Room’s color palette reflects the mountain environment and features the same balance of modern and rustic materials used in the residences. The team chose plush, comfortable furnishings that still retain their sophistication. “It’s a true gathering space, and the connection point to play zones for kids and teens,” says Rodeheaver. Every resort needs a pool, but the Lift design team extended this year-round feature into a fully landscaped, outdoor living room. The approximately 4,750-square-foot space includes a large swimming pool with cabanas and a hot tub located close to the fitness center with easy access to changing rooms. A second, larger slopeside hot tub provides views of the Retreat ski-home trail and fire pits, and an outdoor living room area invites owners and guests to relax, recharge, and catch up after a day on the mountain. With large gear lockers included with each unit, owners have plenty of space to store mountain bikes, fishing gear, and any other toys for year-round recreation. The design team considered every inch of Lift’s outdoor and indoor living spaces to emphasize connections, place, and balance to make Lift a place you yearn to be—home. Explore it. To learn more, visit Liftparkcity.com or call Mark Rodeheaver at 435.659.8993.